A new tiny snail, I haven’t seen before. The Acer drops seeds and the seedling are being potted up. In Victoria known as Virginian Creeper, in Tasmania known as Boston Ivy. These creepers are growing on the water tanks. Verbena, still a few jewels to be found. This entry was posted in Garden, Photographs and tagged Autumn, colour, garden, photos, plants on March 11, 2015 by bkpyett. Kings Park Special, a common Callistemon street tree in Pearcedale. Melaleuca hypericifolia is one of those plants that is so undemanding and yet beautiful with or without flowers. It is a very similar flower to the Callistemon. Like the Callistemon it is suitable to make into hedges or windbreaks, though mine is stands solitary near the front entrance. The birds love it. I like the way this plant has a gentle colour and is more unassuming than the Callistemon, that shouts to be noticed. This entry was posted in Garden, Photographs and tagged callistemon, drought tolerant, Melaleuca, plants on November 19, 2014 by bkpyett. This entry was posted in Garden, Photographs and tagged colour, garden, nature strip, plants on October 26, 2014 by bkpyett. Daphne is a perfume that is delicate and fragrant. In Australia it is out at this time of the year. I have just moved my pot today from the shade under the lemon tree. It is not yet out, nor is it doing well. Daphne loves the morning sun, as do most plants. My neighbour’s Daphne plants are fully out, so thank you goes to Moyra for letting me photograph hers. Perfumes are a strong stimulant for memories. For me the perfume of Daphne takes me back to my childhood, to my Mother’s prized plants. They were big enough to pick large pieces to bring inside to fill the house with their aroma. Ben’s freshly baked bread and the smell of coffee percolating are wonderful homely smells too, but today the plants take precedence. Freesias, violets and Boronia are the next flowering plants that are in my top five favourites. The spring bulbs are not far behind with their heady aromas. A world without smell or perfumes would be very dull. Can you smell the Daphne? This entry was posted in Daily post and tagged Daphne, perfumes, plants on July 18, 2014 by bkpyett. Collections, what makes us do this? Collecting things has been something in my blood. From the shells that I constantly filled my pockets as a child, to the buttons, stamps and swap cards. There’s an endless list. 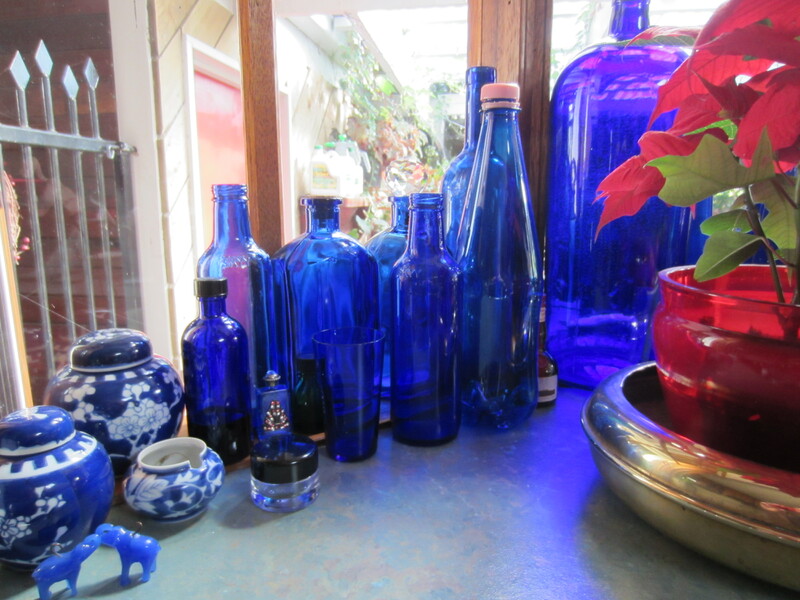 Today I’m going to share with you my blue bottle collection. 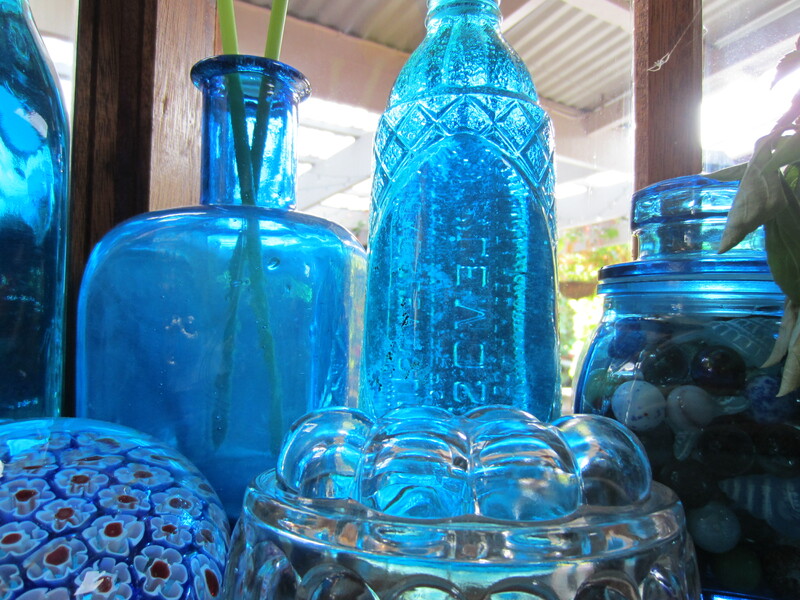 Each bottle has a story, history, if you like: who gave it to me? where it was purchased? which town or country? and the associated memories. This is the trouble when you get old, the memories accumulate. What do we do with them? Some live inside these bottles! Perhaps a short story lies within? 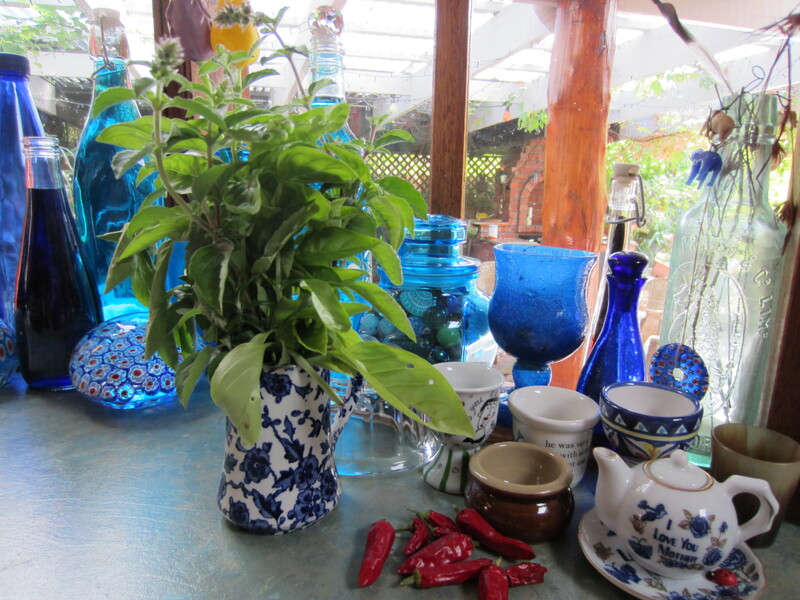 Some chillies and herbs from the garden. The little teapot, with ‘I love Mother’ came from a wall cavity, when my son was renovating their flat in Sydney! I would love it if you would share some of your collections. Then I might be brave enough to show you some more…. Perhaps my failing now is for plants; such temptations lie at the local nursery. What tempts you? 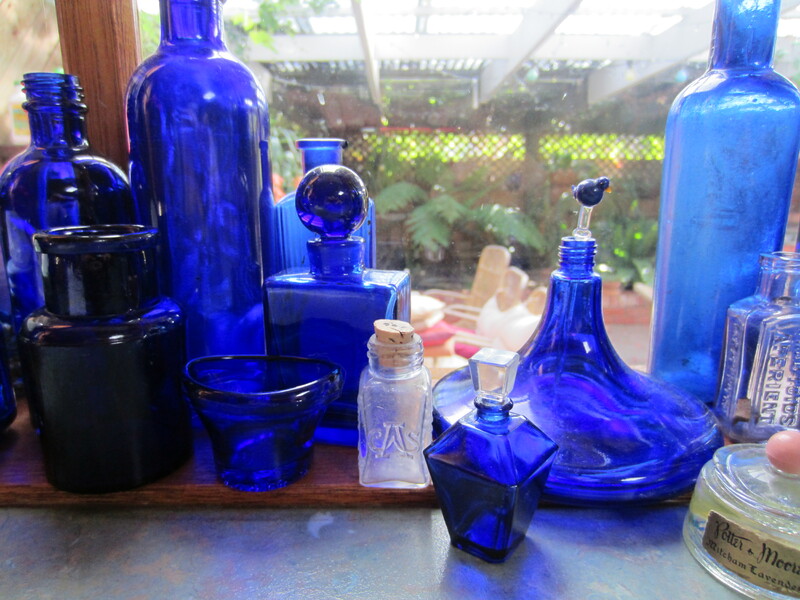 This entry was posted in Uncategorized and tagged blue, blue bottles, bottles, collecting, collections, plants, shells, short stories, stamps, stories, swap cards on March 13, 2014 by bkpyett.